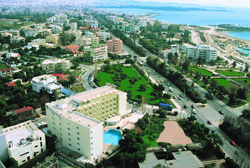 The Hotel Fenix is conveniently located at the attractive coastal resort of Glyfada, only a 20 minute drive from the center of Athens and 24 Km from the New Athens Int’l Airport ''Eleftherios Venizelos” which can be easily accessed by public transportation, Taxi or the Hotel’s shuttle bus (upon request). The location provides endless possibilities for leisure activities and entertainment, for Glyfada boasts the best golf course in the country, a bustling and cosmopolitan shopping center, marinas, beaches and great variety of nightlife. With its excellent facilities for conferences and meetings, the Fenix is an excellent choice for both business and pleasure. Recently renovated, the hotel has 130 comfortable rooms and 4 suites, all equipped with double glazing, mini bar, TV with satellite reception, In-house movies, Direct dial telephone, ISDN lines, Wireless and Fast broadband Internet connection, Data port, Private balcony, Private facilities with bath tub or shower, Air condition, Hair dryer, Safety deposit box. Non smoking rooms are available. Amenities include a restaurant serving a wide range of international cuisine, the magnificent Rotonda bar, outdoor swimming pool and sufficient parking space in the surroundings. The majority of the rooms have balconies, most of which overlook the Saronic Gulf. The Rotonda bar and the swimming pool area are ideal for meeting clients and associates in a warm atmosphere or just relaxing. Free Internet Access. 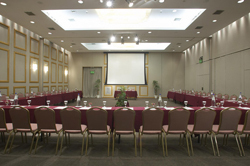 The Hotel Fenix has facilities for conferences, seminars, business meetings, product presentations and social events, fully equipped and tastefully decorated. The equipment includes Wireless and Fast broadband Internet connection, slide, data and overhead projectors, various screen sizes, microphone installations, PA system, tape decks, CD & DVD players, TV monitors, video cameras/recorders and laser printers. The staff of the Banquet and Conference Department is highly trained with broad experience in organizing all types of meetings and functions from 10 up to 250 persons. 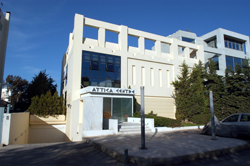 The Attica Center is operating since September 1999 with great success. The multi-purpose center is the ideal venue for cultural, educational and conference events such as exhibitions, product presentations, fashion shows, press conferences, seminars, business forums and shareholders’ meeting. The center comprises a large hall of 180 m2, which can be extended to 250 m2 or divided into three autonomous, sound-isolated areas. In addition, there is a fully equipped boardroom for 16 persons and an outdoor area (250 m2) with a magnificent view, suitable for a variety of events.